The nexus between teaching and research in the sciences is a large one. 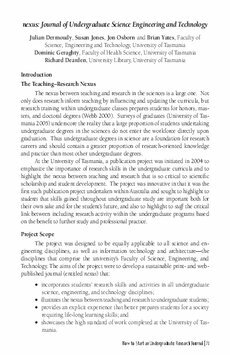 Not only does research inform teaching by influencing and updating the curricula, but research training within undergraduate classes prepares students for honors, mas- ters, and doctoral degrees (Webb 2000). Surveys of graduates (University of Tas- mania 2005) underscore the reality that a large proportion of students undertaking undergraduate degrees in the sciences do not enter the workforce directly upon graduation. Thus undergraduate degrees in science are a foundation for research careers and should contain a greater proportion of research-oriented knowledge and practice than most other undergraduate degrees. At the University of Tasmania, a publication project was initiated in 2004 to emphasize the importance of research skills in the undergraduate curricula and to highlight the nexus between teaching and research that is so critical to scientific scholarship and student development. The project was innovative in that it was the first such publication project undertaken within Australia and sought to highlight to students that skills gained throughout undergraduate study are important both for their own sake and for the student’s future, and also to highlight to staff the critical link between including research activity within the undergraduate programs based on the benefit to further study and professional practice.